I think I’d pluck myself bald in this room. Too much clutter, but also it’s the paintings hanging on the bookshelves…just can’t do that. This is not my favorite either. The different colors and textures set my teeth on edge a bit. But I do like looking through the doorway & seeing still more shelves in the next room! And they do look like real books. Just a tad over-stuffed … but I can see how this can happen. Obviously the home of a collector and not simply a book collector. Mind you, you’d never be bored here. When there’s nothing you want to watch on TV there would always be something worth looking at here! This is a little over cluttered for my taste, although I’m prone to collecting bits and pieces and leaning small pictures on the bookshelves. I don’t like the pinks either and I hope that’s not a real cat skin on the back of the sofa. When I see a room like this, I wonder if they have a housekeeper! It must take forever to clean it! Yep, bit busy for my tastes too! How would you see the books behind the pictures? 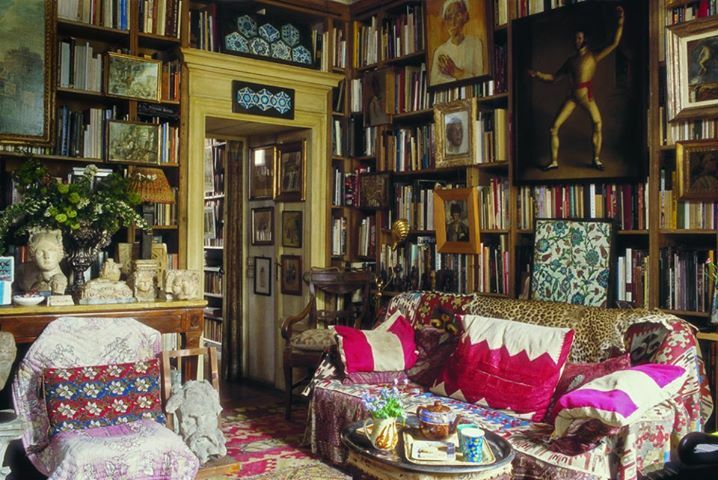 on September 28, 2014 at 14:57 | Reply Kathy D.
I like all your Library Lust pictures but this one in all its cluttered glory is makes me really happy and envious. John would never let me clutter ours up that much.